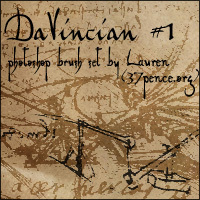 DaVincian #1 by Lauren (from her site 37pence.org) is a set of Photoshop brushes made using sketches and handwriting from the notebooks of Leonardo Da Vinci. The brushes are perfect for a variety of purposes: adding a touch of the eccentric genius to your work with his scribbling, or some Renaissance flair with a particularly elegant flourish of his cursive. They even work with the steampunk aesthetic, as they feature some sketches of obscure lever assemblies and–as the set’s crowning glory–a winged Da Vinci flying machine. The flying machine is really the centerpiece of this brush set, with a separate medium version and large version. It’s a truly fantastic contraption; with its huge mechanical bat-wing it looks like (and probably is!) the great-granddaddy of all steampunk designs. The delicate pen lines and level of detail in the drawing also make it a work of art in itself. The lever assemblies are smaller and sketchier, with short scrawled notes attached to them. They’re useful little background touches to build atmosphere in a piece. The handwriting samples in the brushes vary in size and style, and some of them seem to be examples of Da Vinci’s famous ‘mirror writing.’ They’re mostly unintelligible, but of course the important thing is that they look very elegantly old-fashioned and intriguingly mysterious. Altogether this brush set is perfect for a bit of period or steampunk flair, and Da Vinci’s scribblings should help a bit of his eccentric genius rub off on your work as well.